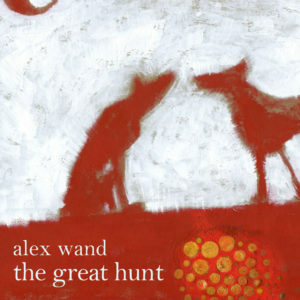 The Great Hunt is a song cycle for chamber ensemble based on poems by Carl Sandburg. The inspiration for the song cycle came from Carl Sandburg’s haunting and melodic delivery of ‘Cool Tombs’, as heard on recordings. The chosen poems all confront death from different perspectives – an old man, a lover, Abraham Lincoln, Pocahontas, a galapagos turtle, a lap swimmer, and more. The music channels the haunt and folk of Carl Sandburg by juxtaposing American folk inspired melodies with microtonal harmonies, extended harp techniques and sprechstimme vocals. This song cycle features a Just Intonation National steel guitar and an well tempered classical guitar. The National steel guitar, which I play in the last two songs, is in a tuning based on Lou Harrison’s 11-limit Just Intonation scale. I put the frets on this guitar myself and left the top two strings fretless. For the other songs, I play a re-fretted classical guitar. I designed the tuning of this guitar using software Larry Polansky created as part of his Optimal Tuning Systems project. This program allowed me to defined a set of ideal pitches and give weight to keys and intervals that I wanted to be most in tune with respect to the ideal pitches. I chose a 5-limit Just Intonation chromatic scale as my ideal set of pitches with special weight given to the keys of A, D, E, and B. The result is a well temperament with a hierarchy of keys where the the highest ranked keys approximate Just Intonation intervals quite nicely. My experience from playing this guitar, though, is that even the lowest ranked keys are perfectly usable, which is the whole idea of a well temperament tuning. The overall effect is a sort of lack of homogeneity as compared to 12-tone equal temperament. That is, every key has it’s own subtle intervallic flavor. Alex is a Grammy Award-winning musician and composer based in Los Angeles. His music has been described as having “melody lines that can circle through one’s head for days after listening, begging to be rewound and re-listened and timbres and layers that are supremely joyful and poignant and at times absolutely laid bare in their sincerity” (New Classic LA). He is a guitarist and singer who has performed at venues and festivals from California to Tibet such as REDCAT, MicroFest, the Bootleg Theater, and the Xinghai International Poetry Festival. 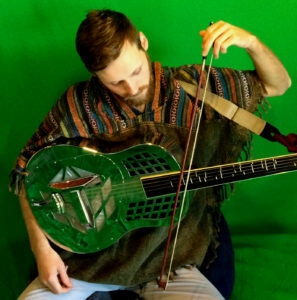 Alex performs as a solo artist and in Three Thirds, Desert Magic, and Partch. He often writes music for film and video with recent projects including The Harvest Run (full-length documentary) and Porcupine (dramatic narrative starring W. Earl Brown). In addition to composing and performing, Alex teaches music at Fusion Academy and works as a music arranger/transcriber for Soundslice. In 2014, he founded Song A Day For A Month, a challenge to musicians to write and upload a song every day for a month on www.songadayforamonth.com. With sessions every January and July, the collective has written over 3,000 songs. Originally from Detroit, he studied music composition at the University of Michigan and at CalArts with composers Bright Sheng, Michael Fink, Ulrich Krieger, and Wolfgang von Schweinitz. Recorded September 16th and 21st, 2015 at Pinnacle College in Alhambra, California.